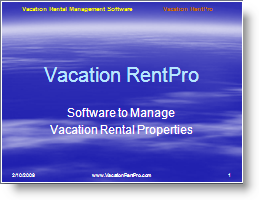 The Slide Show provides the most complete and up to date tour of the screens and features in Vacation RentPro. Click the image on the right and wait for the first slide to display as shown. Use your Page-up and Page-down keys to change slides. The link below provides examples of how VRP can be integrated with your website. It also shows examples of websites we can optionally create for you to provide a fully integrated website which you can easily manage, (after our one-on-one training). *** Please Note *** These videos were made a few years ago. Please see the Slide Show above for the most current screens and information. Copyright © 2006 - Present, Harp1 Business Solutions. All Rights Reserved.